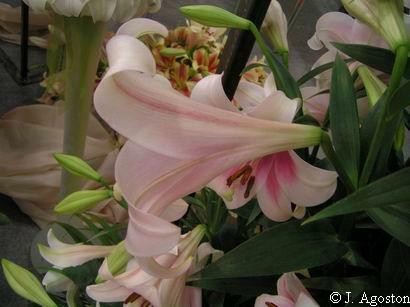 Pictures of some of the Lilium hybrids are found here. 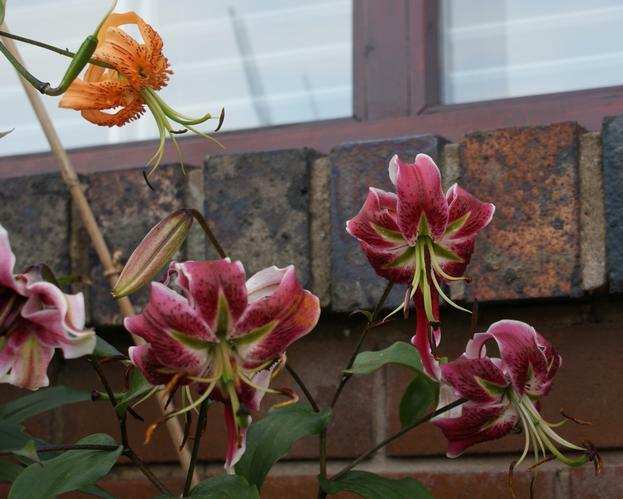 For information and photographs of Lilium species see the sections below or go to the Lilium index for an alphabetical list. 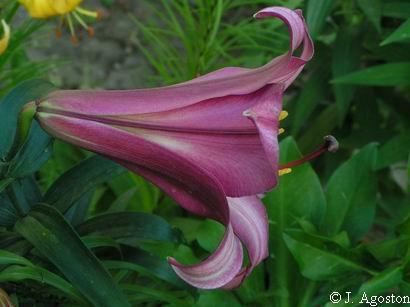 Lilium 'African Queen' is a trumpet hybrid. Photographed by Janos Agoston. 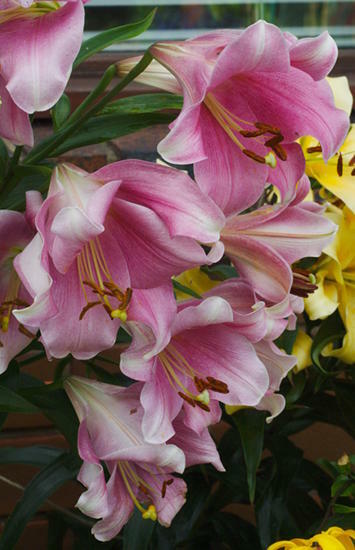 Lilium 'Anastasia' is an Oriental Trumpet hybrid with large scented pink flowers. It is a winner of the NALS popularity poll. Photographs taken by David Pilling around late August in North West England. 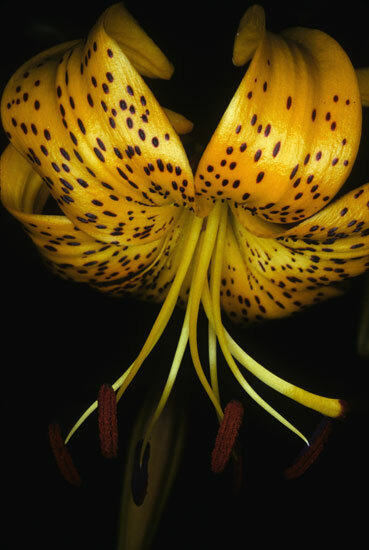 Lilium 'Black Beauty' is a hybrid of L. henryi and L. speciosum created by Leslie Woodriff. 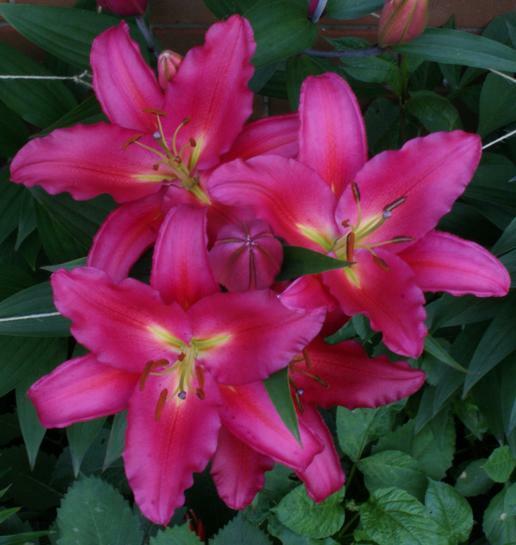 Originally a sterile diploid, when converted to tetraploid form it became the basis of many other hybrids. First photograph Gary Buckley, Tasmania; remainder taken by David Pilling around mid-August in North West England. 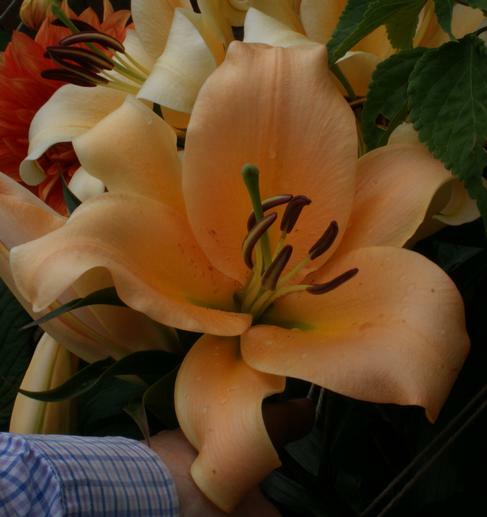 Lilium 'Brunello' is an Asiatic hybrid described by Dave Karnstedt as "spotless, upfacing lily with broad tepals of heavy substance and smooth texture and colored the most beguiling shade of soft, pure orange". Photos by Janos Agoston. 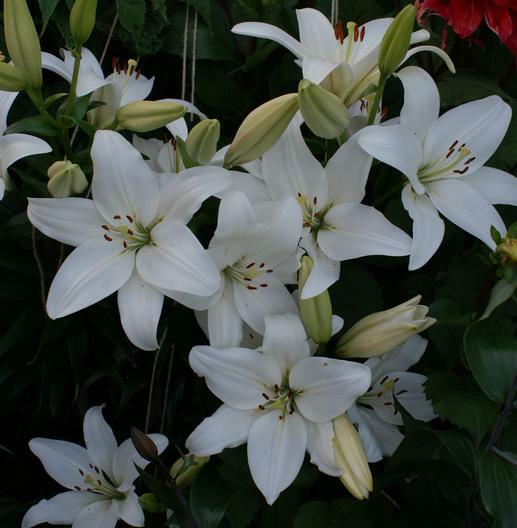 Lilium 'Casa Blanca' is an Oriental hybrid with large white scented flowers. 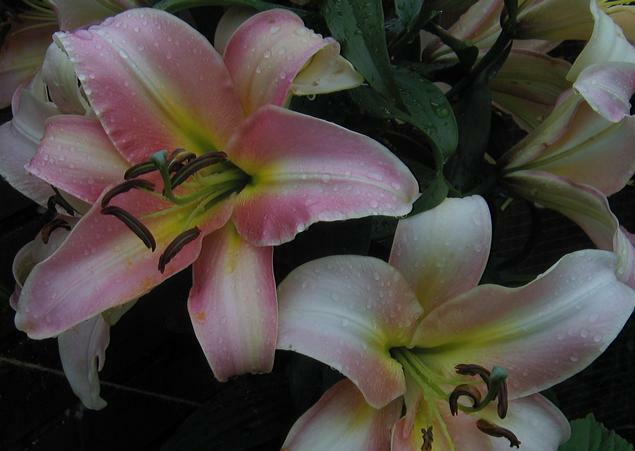 A popular cut flower, Yves Saint Laurent is said to have had a fresh vase of these lilies every day. Photographed in NW England in early August by David Pilling. 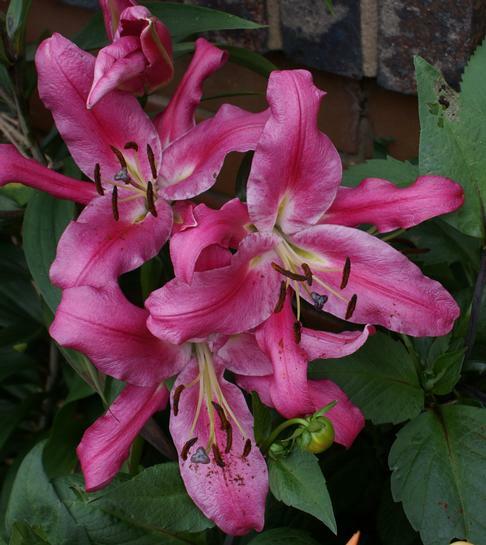 Lilium 'Chiara' is a Longiflorum Oriental hybrid with large pink scented flowers on stems 5 feet high. Photographed in NW England at the end of July by David Pilling. 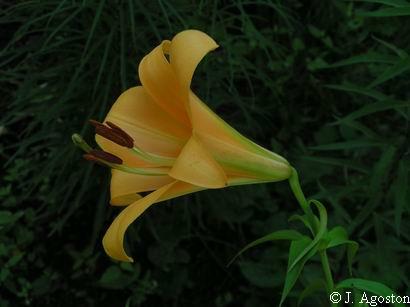 Lilium 'Citronella' is a strain of Asiatic hybrids (Lilium davidii var unicolor × Lilium amabile var luteum) selected at Oregon Bulb Farms, that is yellow, hardy and very fragrant. 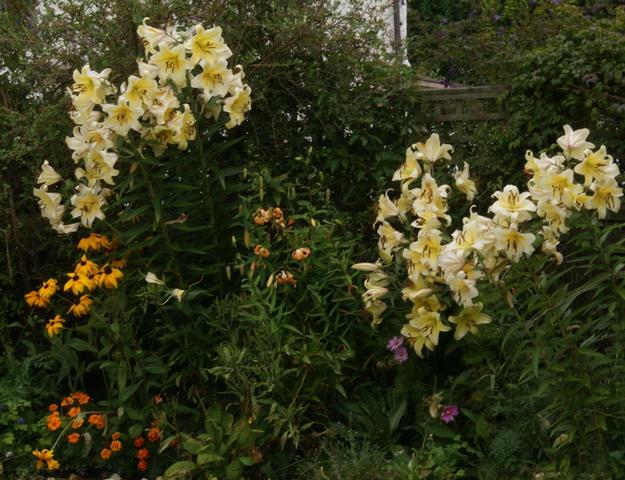 First photo of plants in cultivation (Mary Gerritsen's garden) by Ron Parsons. 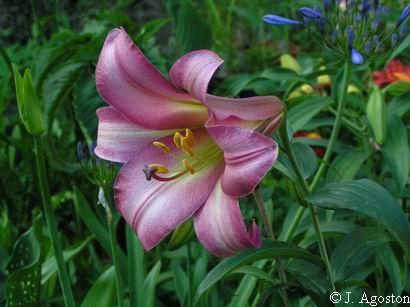 Remainder by David Pilling who comments that his example of this lily did not always grow well and had no scent. 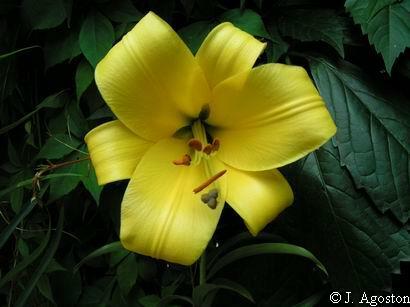 Lilium 'Conca D'or' is an Oriental Trumpet hybrid with large yellow scented flowers on stems 5 feet high. It was hybridised in Rijnsburg, the Netherlands in October, 1995 and is described in US patent PP16479. 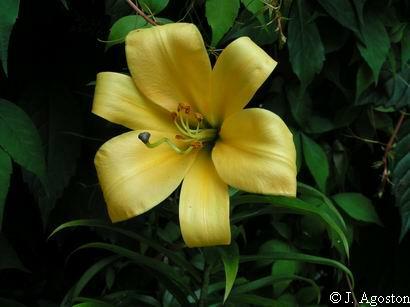 It looks quite like L. 'Manisa' but the flowers are bigger and a deeper shade of yellow. It was elevated to the NALS 'hall of fame' in 2011. Photographed in NW England at the end of July by David Pilling. 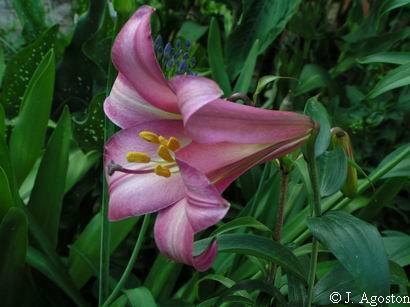 Lilium 'Eudoxia' is an Oriental-Trumpet hybrid. 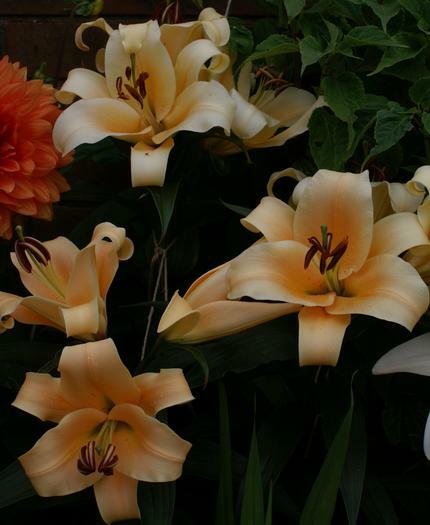 It is not quite as orange in real life as some of the photos on the web; in time the flowers fade to cream. Height about four feet. Photographs by David Pilling taken in the first weeks of July in North West England. 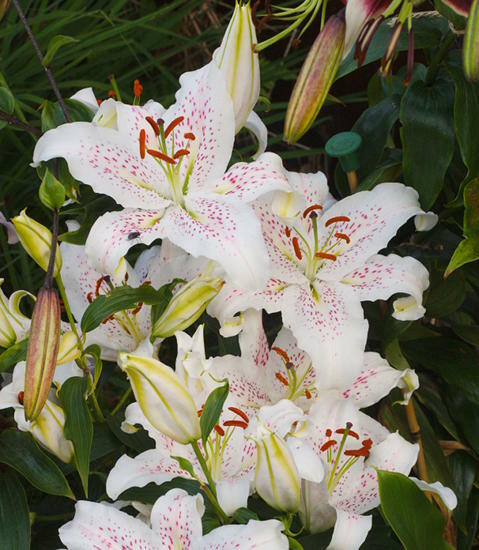 Lilium 'Extravaganza' is an Oriental hybrid around four feet high, which has 10 inch across white scented flowers with carmine spots. Photographed by David Pilling at the start of August in North West England. 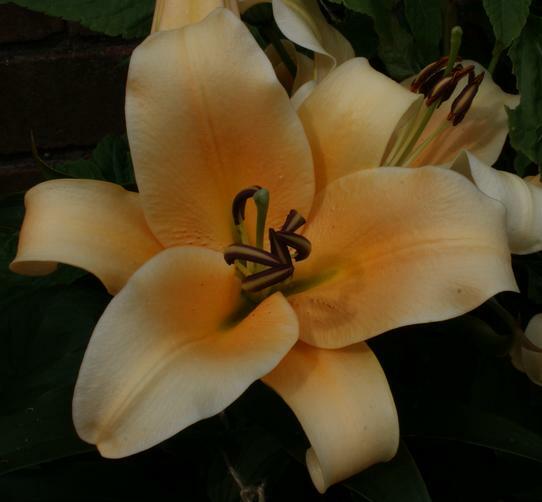 Lilium 'Golden Splendour' is a strain of trumpet hybrids. Photographed by Janos Agoston. 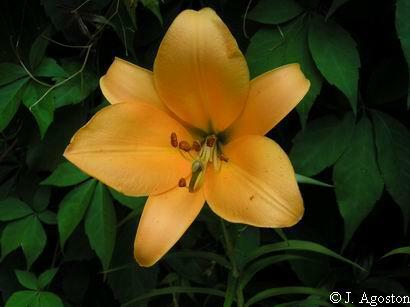 Lilium 'Golden Stargazer' is claimed to be the first yellow oriental lily, described in US patent PP09794. 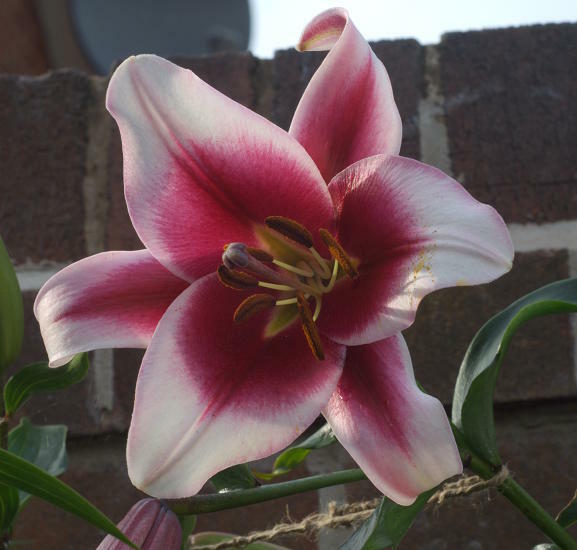 Flowers are 8 inches across and scented. Photographed in NW England at the end of July by David Pilling. 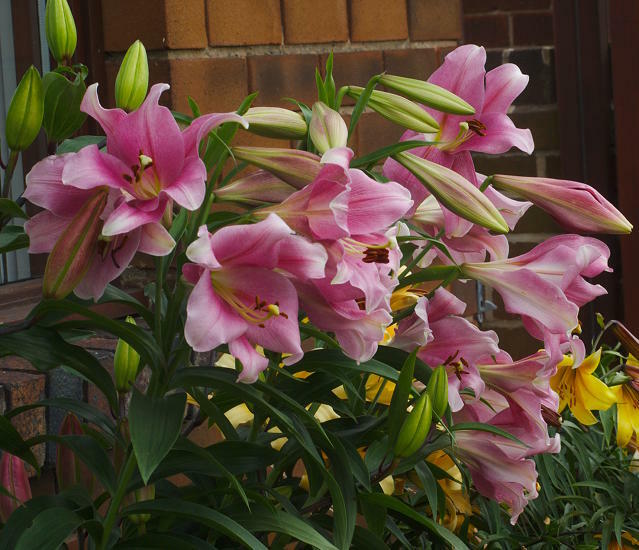 Lilium grown from seed furnished by Sir Peter Smithers labeled Pink Trumpet. 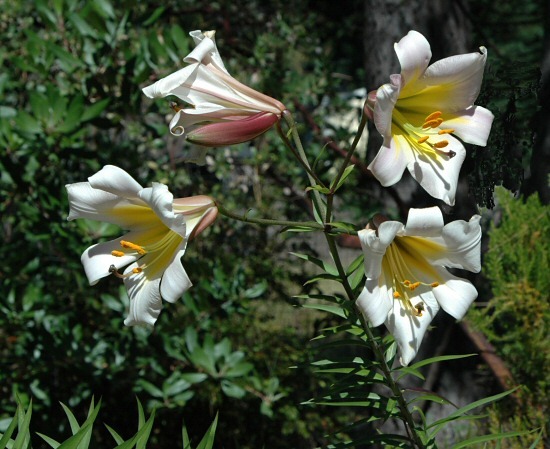 These plants have been reliable and robust in my Northern California garden surviving with a lot of winter water when dormant and very little summer water when in growth and blooming in July. Each year the color is a little different. 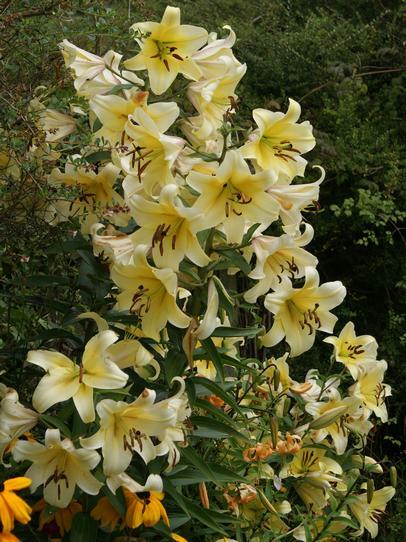 Some years they have been pink and other years the buds are pink but the flowers look cream with a distinctive yellow throat. Photos by Mary Sue Ittner. 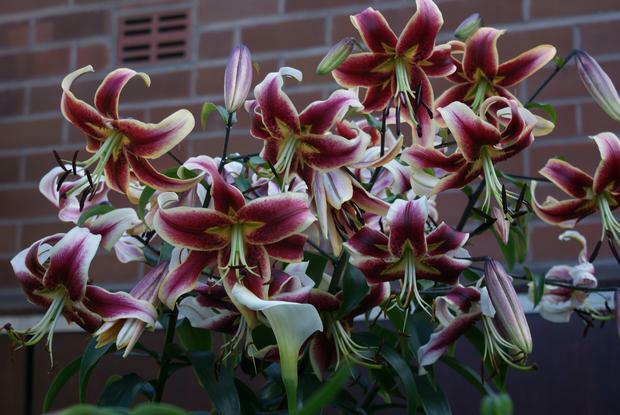 Lilium 'Leslie Woodriff'' is an Oriental Trumpet hybrid, created by Robert Griesbach by crossing tetraploid forms of L. 'Black Beauty' and L. 'White Henryi' and named for Leslie Woodriff, the legendary lily grower. 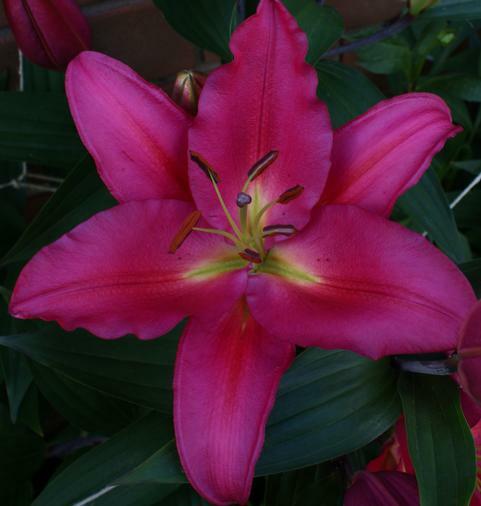 See L. 'Stargazer'. 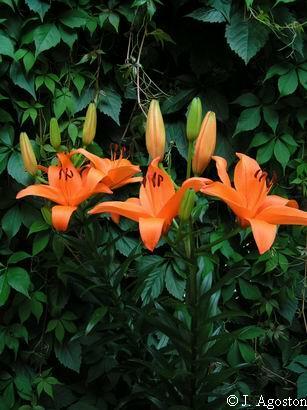 It has frequently topped the NALS popularity poll and grows around five feet high. 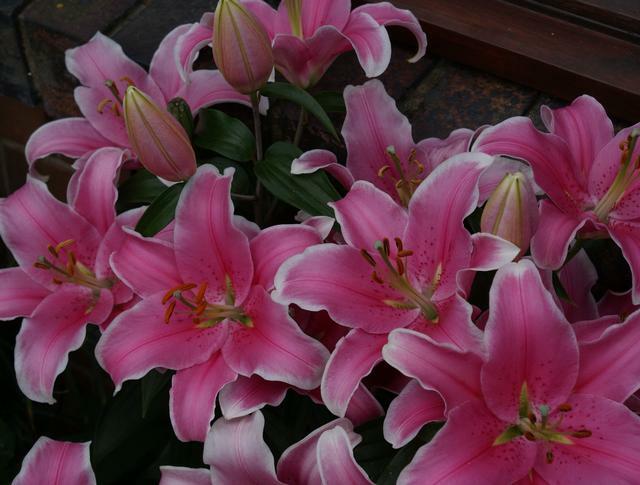 Photographs taken by David Pilling in the middle of August in North West England. 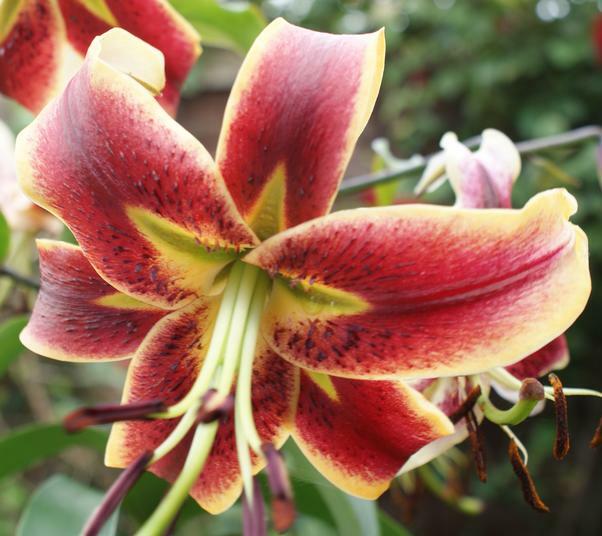 Lilium 'Manisa' is an Oriental Trumpet hybrid with large scented flowers. 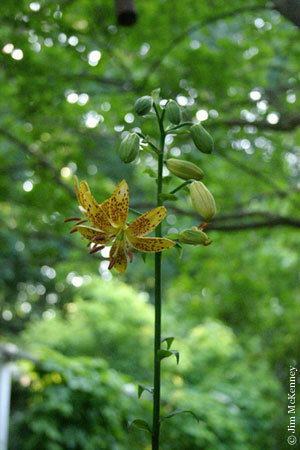 Sometimes called a "Tree Lily" because it can grow 2 metres high. Photographed in NW England in late July by David Pilling. 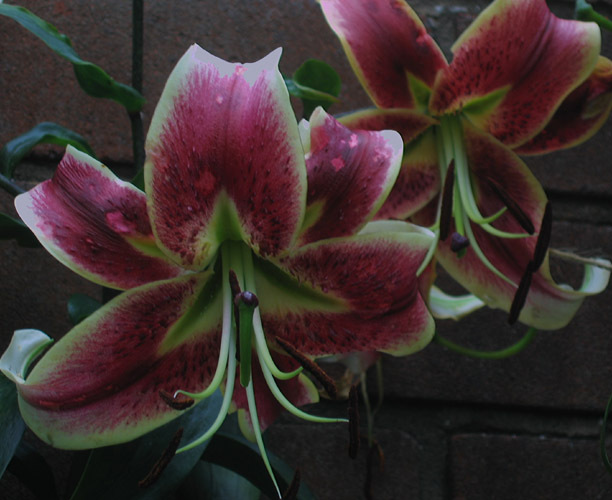 Lilium × marhan 'Mrs. 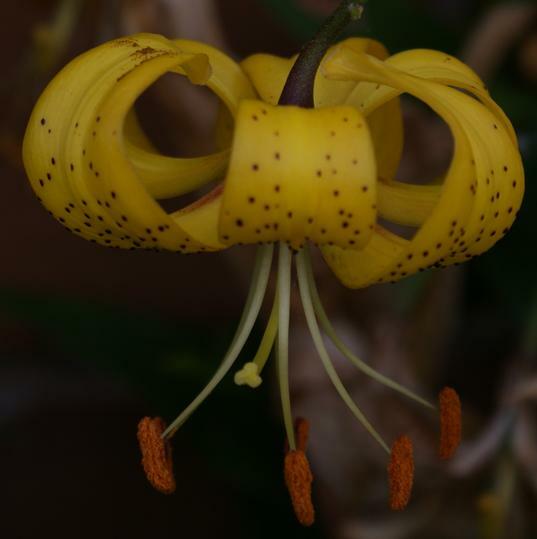 R. O. Backhouse' (Lilium martagon × Lilium hansonii). Named by Robert Ormston Backhouse for his wife Sarah Elizabeth, née Dodgson. 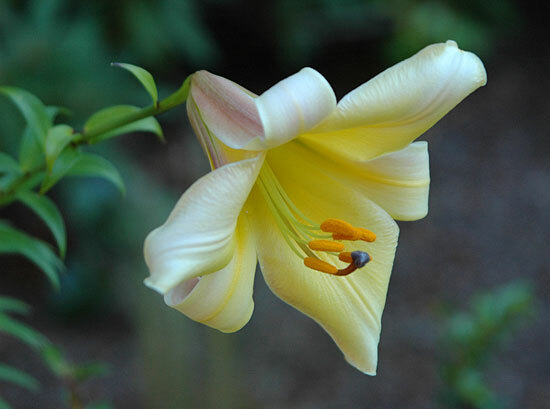 They were part of a family of lily and daffodil hybridisers which stretched from the middle of the 19th to the middle of the 20th centuries, working at Sutton Court in Herefordshire. 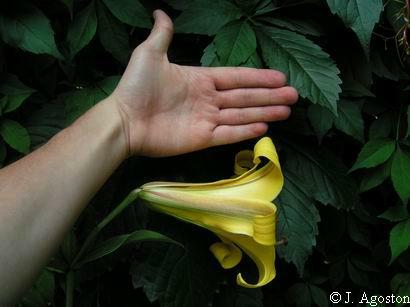 There is a notable daffodil with the same name from the same source. 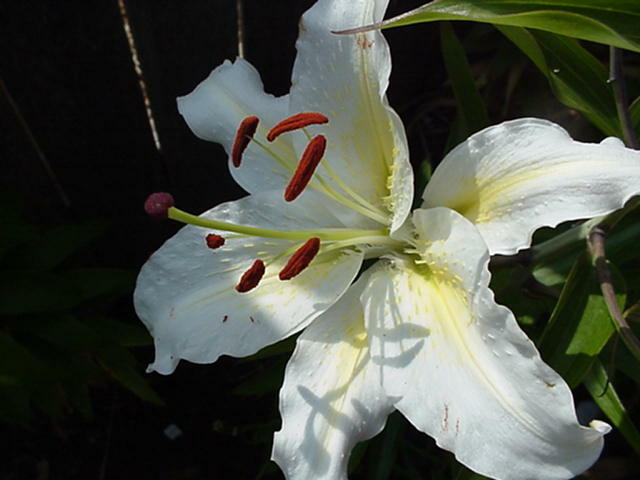 This lily won the AGM in 1921. Seed is often offered under this name, so it seems to be used as the name of a strain rather than a clone. Photograph by Paul Tyerman. 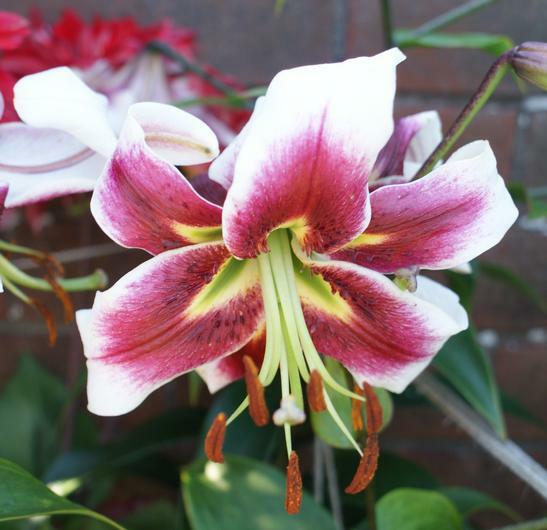 Lilium 'Muscadet' is an Oriental hybrid. 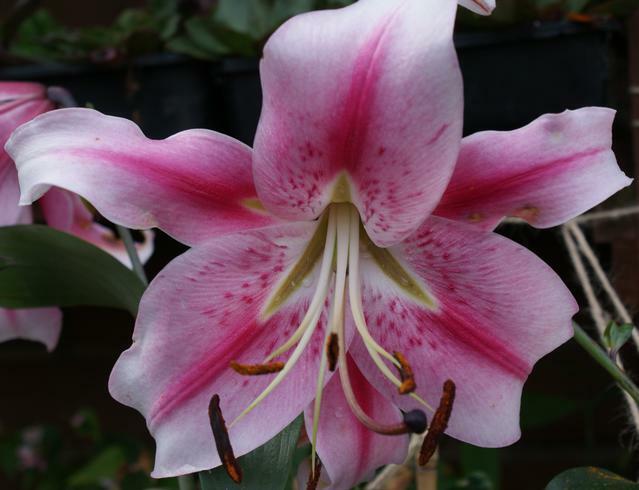 Flowers are 8 inches in size and strongly scented. Photographed in NW England in early August by David Pilling. 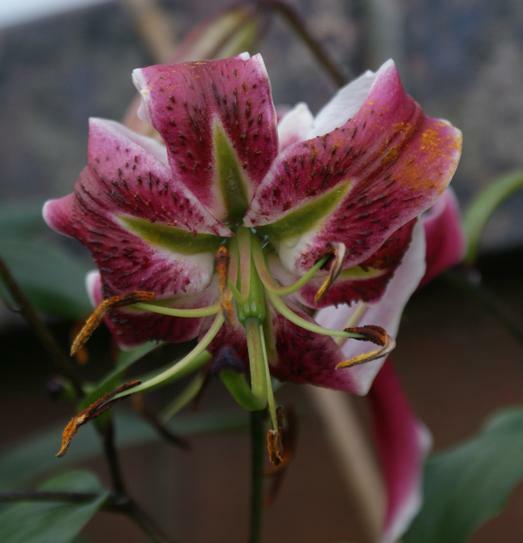 Lilium 'Novonna' is an Asiatic hybrid. Bred by Gebr. Vletter and Den Haan in The Netherlands in the 1980's. 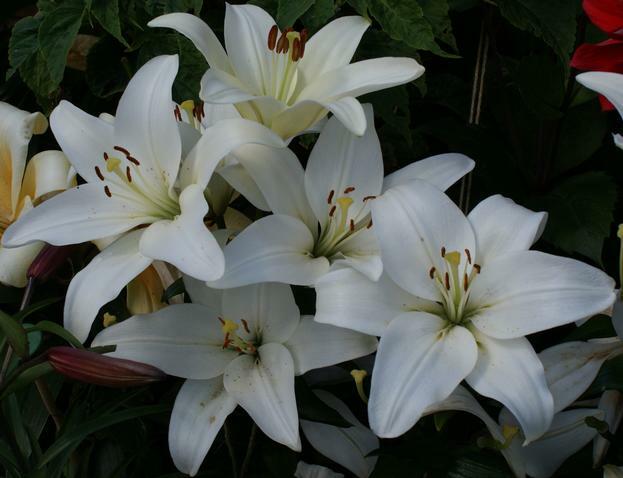 It is claimed to be the best white Asiatic; it looks like the classic large flowered white Oriental and Longiflorum lilies but blooms earlier. 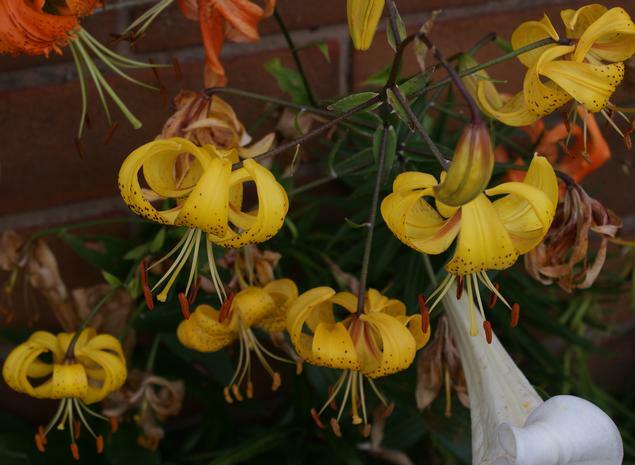 Photographs taken in the middle of July in NW England by David Pilling. 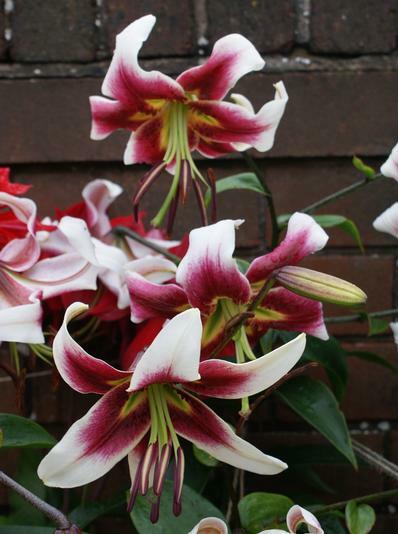 Lilium 'Pearl Lorraine' is a vigorous red tetraploid Asiatic. 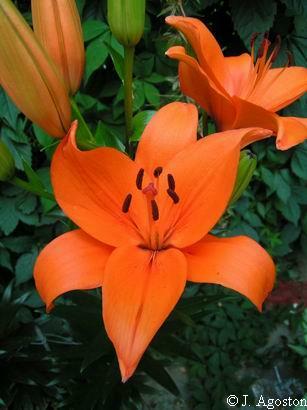 Flowers are 6 inches in size and the stems about 4 feet. Photographed in NW England at the end of June by David Pilling. 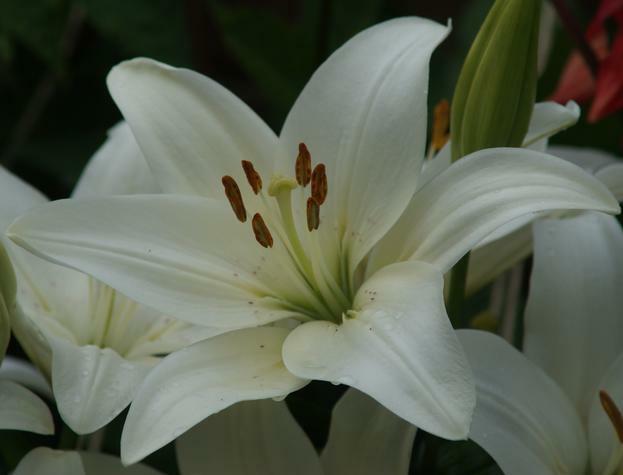 The 'Pearl' series is usually attributed to Dr. Robert Griesbach, taking their names from his grandchildren. However according to this blog, Lorraine comes from another source. 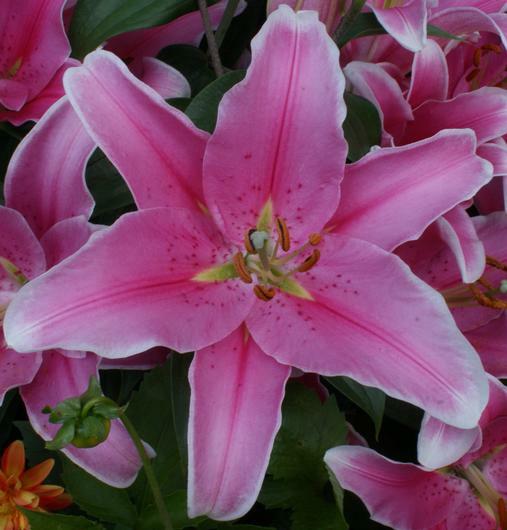 Lilium 'Pink Perfection' is a strain of trumpet hybrids. Photographed by Janos Agoston. 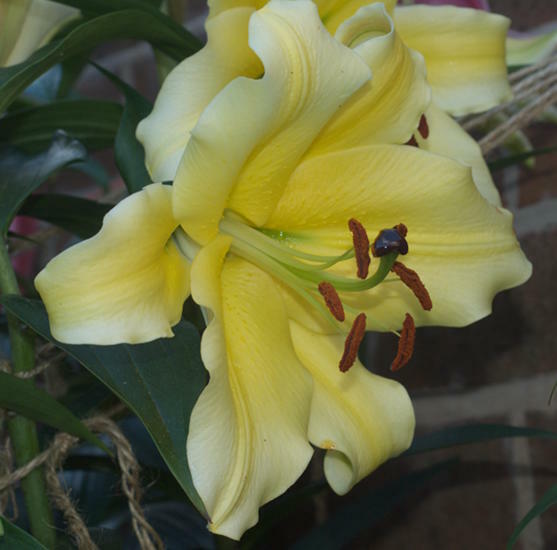 Lilium 'Preston Yellow' is an old hybrid of the martagon group raised by Isabella Preston. 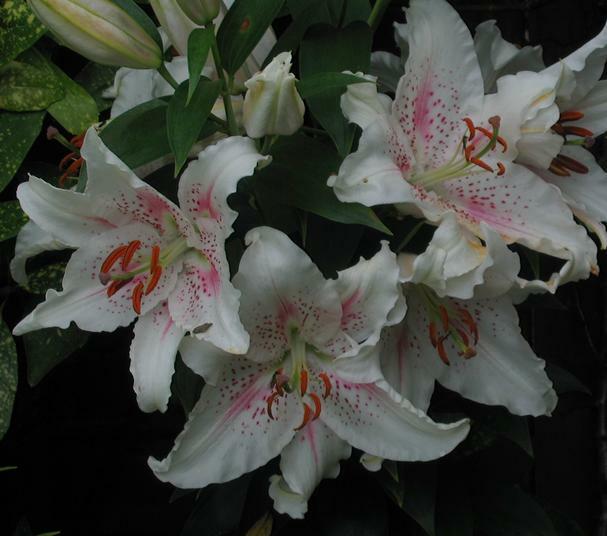 Preston was a Canadian lily hybridist active before the Second World War; she is perhaps best remembered for a then famous series of asiatic hybrids which were called the Stenographer Hybrids. 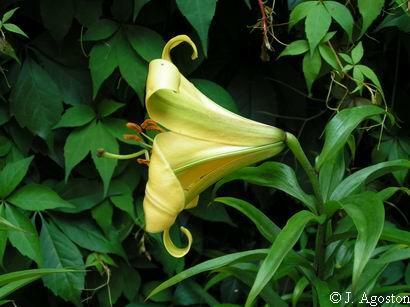 Photographed by and in the garden of Jim McKenney on June 9, 2005. 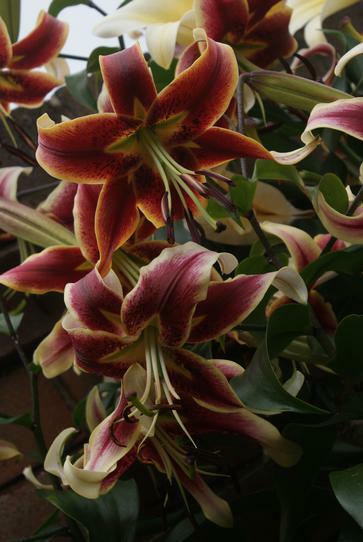 Lilium 'Robina' is an Oriental Trumpet hybrid with stems about four feet tall bearing seven inch scented flowers. Alas it seems prone to producing distorted flowers. 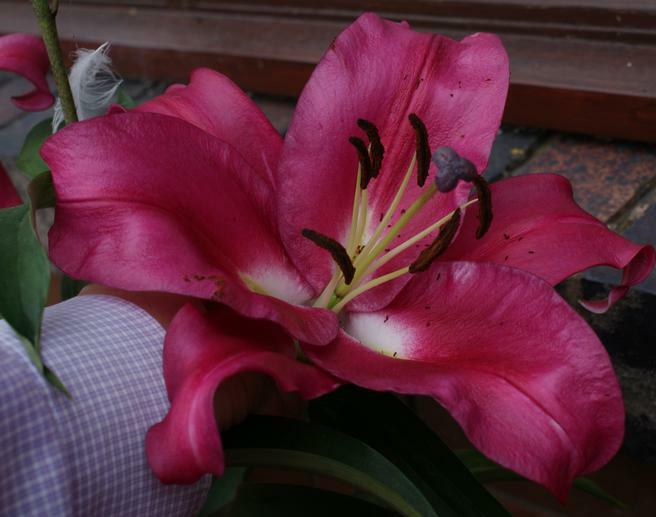 Photographs taken by David Pilling at the end of July in North West England. 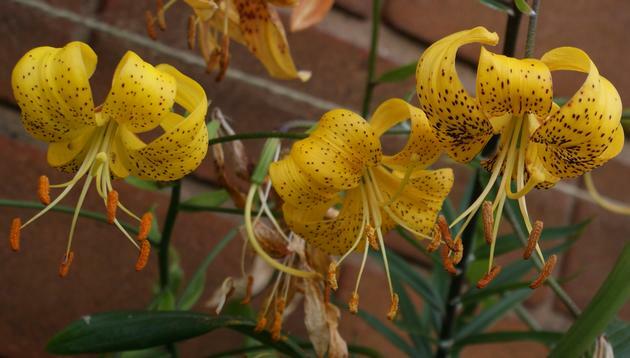 Lilium 'Royal Gold' is a trumpet hybrid. Photographed by Janos Agoston. 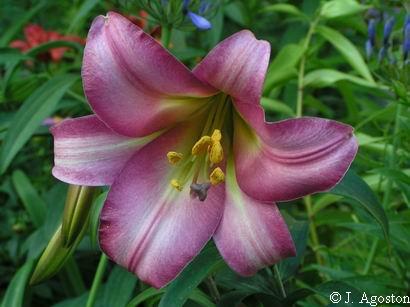 Lilium 'Scheherazade' is an Oriental Trumpet hybrid produced by Judith Freeman of the Lily Garden, Vancouver, Washington. It is a member of the NALS 'hall of fame'. 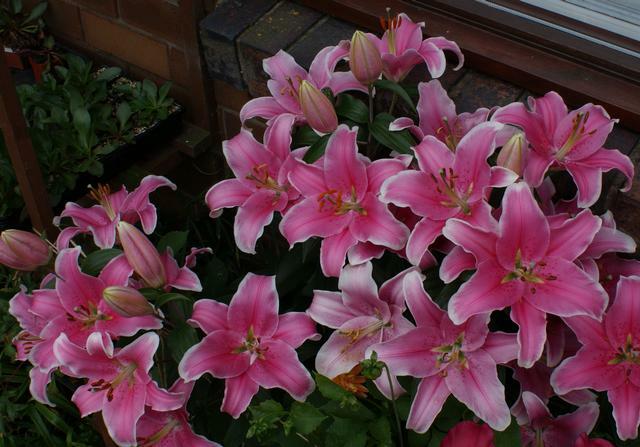 Bloom time in NW England is mid August. Photographs by David Pilling. 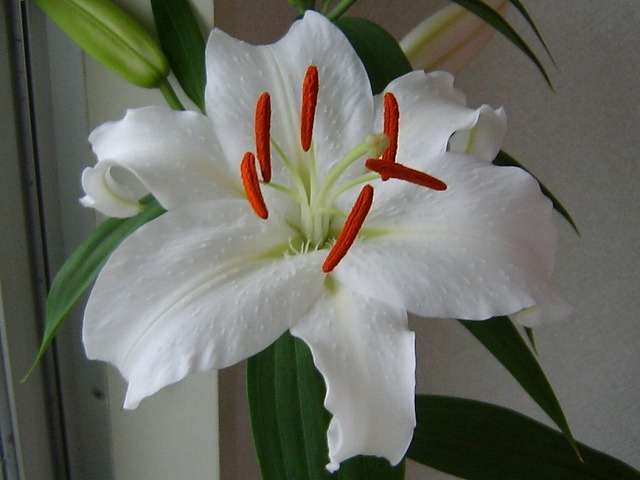 Lilium 'Siberia' is a pure white Oriental hybrid. Photograph by Mari Kitama. 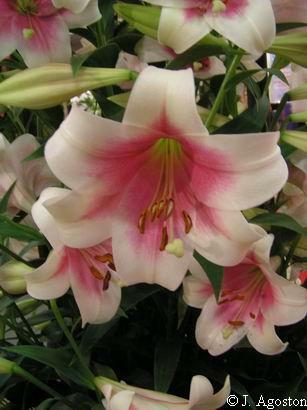 Lilium 'Silk Road' is an Oriental Trumpet hybrid with large scented flowers on five foot high stems. It is a member of the NALS 'hall of fame'. Hybridised by Judith Freeman. Photographed by David Pilling around late July in North West England. 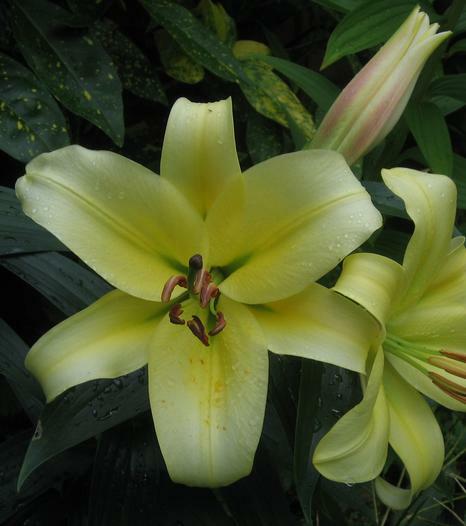 Lilium 'Sorbonne' is an Oriental hybrid, bred by the Dutch in the 1990's. 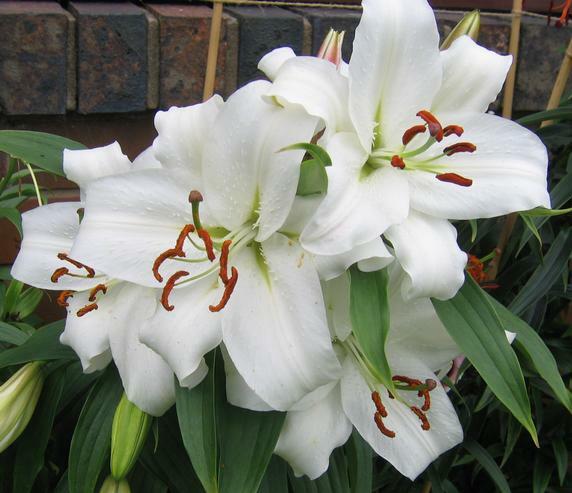 This is an outstanding lily which produces many large upward facing scented flowers on stems about four feet high. It is fabulously pink. 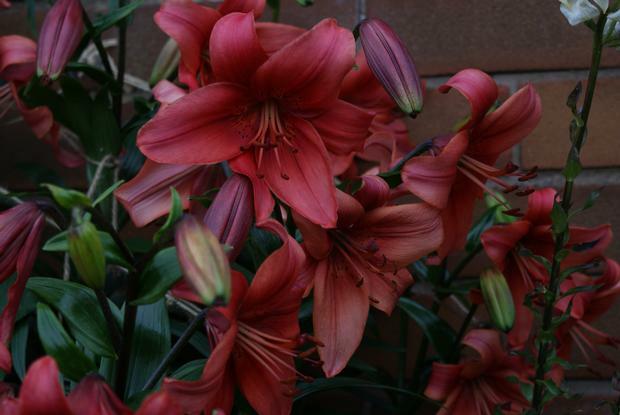 The photographs below by David Pilling show it flowering at the end of July in North West England. 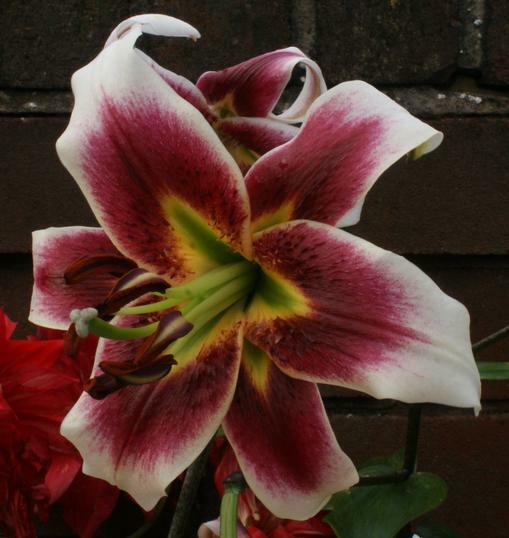 It would probably be good planted with L. 'Stargazer' which starts flowering when 'Sorbonne' has finished but has much smaller flowers. 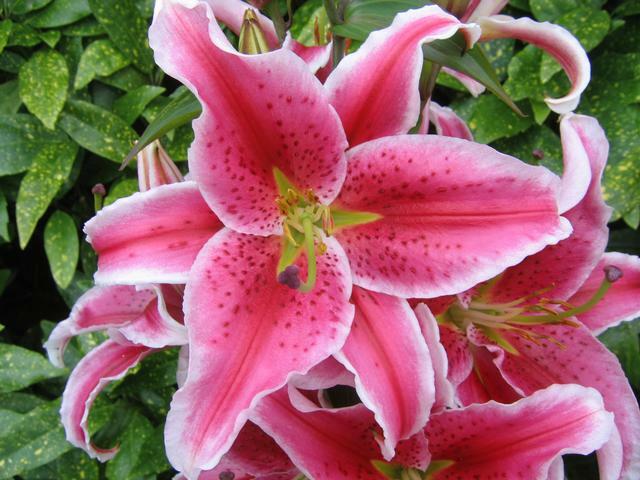 Lilium 'Stargazer' is an oriental lily hybridized by Leslie Woodriff in 1974 at McKinleyville, California. 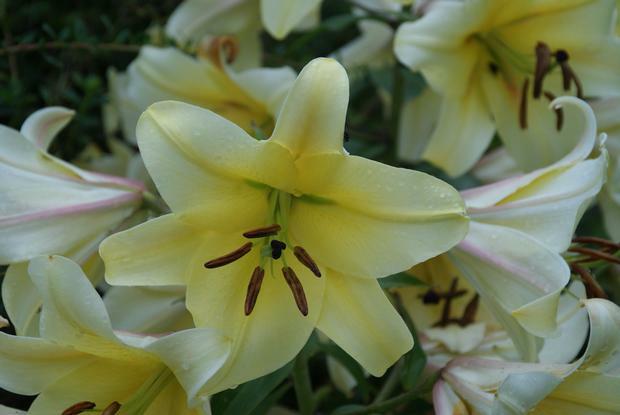 Claimed to be the most popular lily in the world with 1000's of acres in cultivation for cut flowers, it is strongly scented and grows around three feet high. 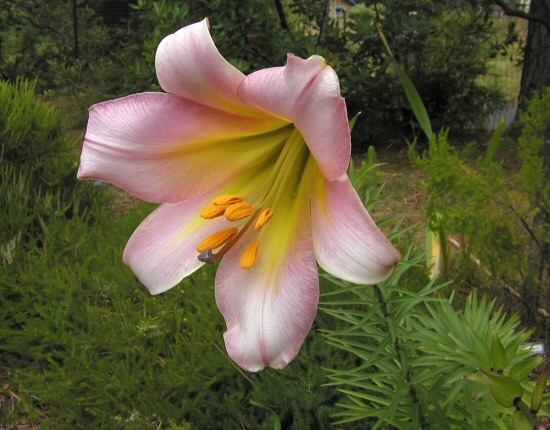 The name celebrates its upward facing flowers. 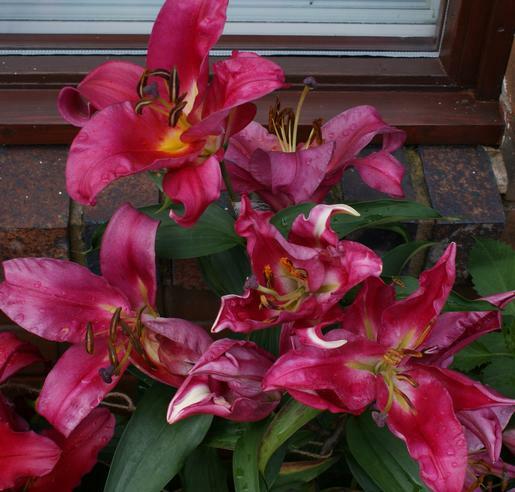 Bloom time in NW England is mid August. Photo by David Pilling. 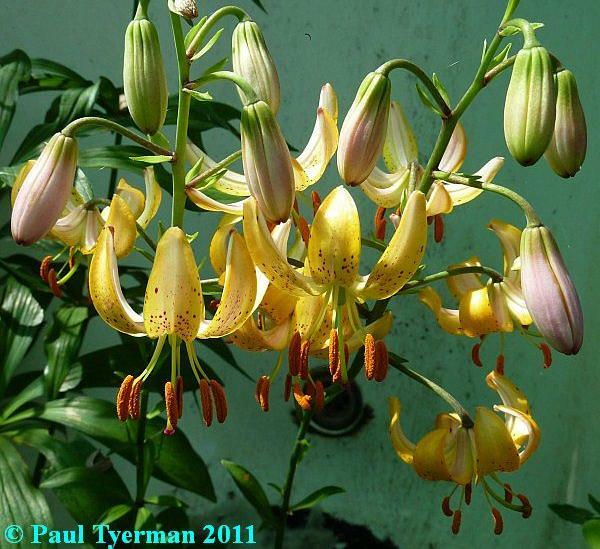 Lilium 'Supreme' Oriental Trumpet hybrid around 5 feet high. 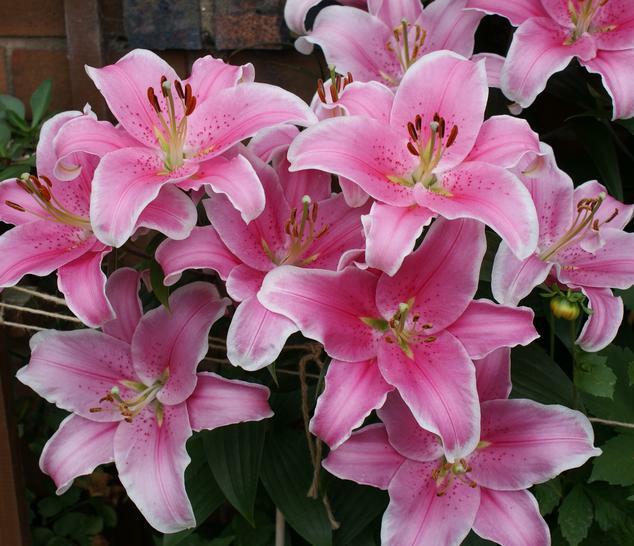 Long lasting flowers are 8 inches across and strongly scented, starting pink with a yellow centre and fading in the sun to cream. Photographed in NW England in early August by David Pilling. 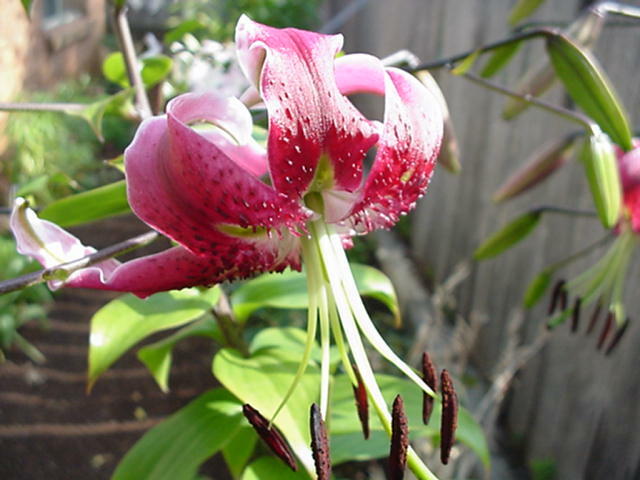 Lilium 'Tarrango' is an Oriental hybrid. 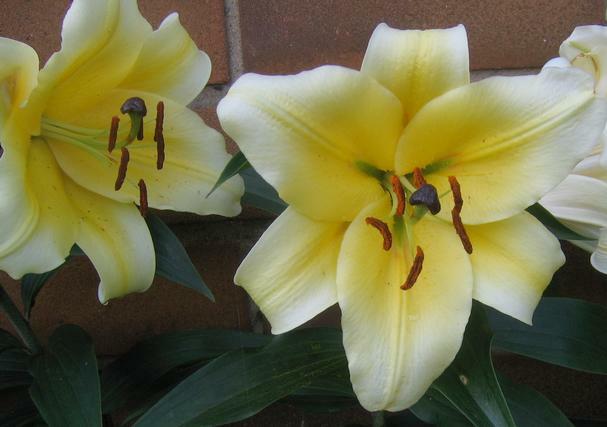 Although Tarrango is a place in Australia, this lily was bred by Gebr. Vletter and Den Haan in Rijnsburg, The Netherlands at the start of the 21st century. 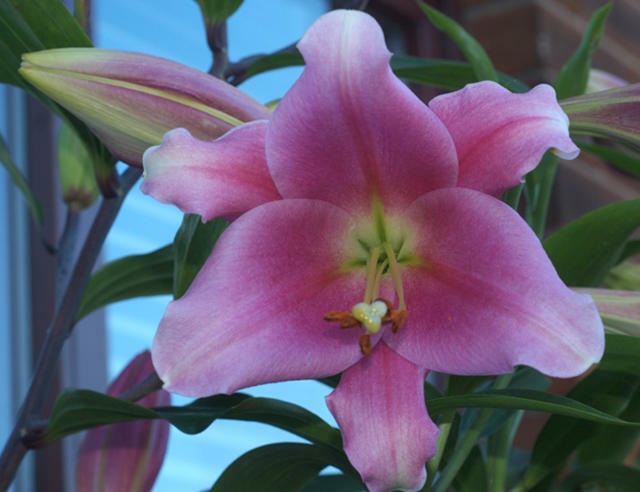 It has scented satin supersized flowers about 8" across. 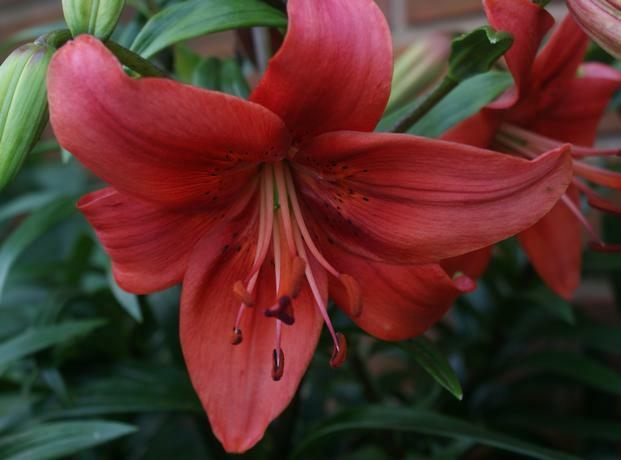 Photographs taken at the start of August in NW England by David Pilling. 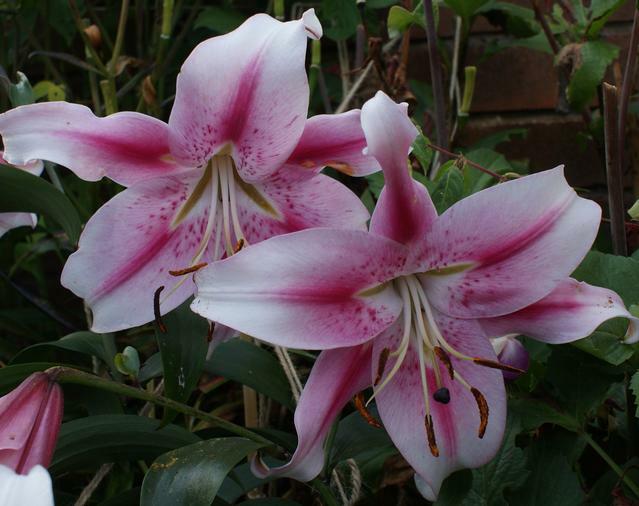 Lilium 'Triumphator' is a Longiflorum Oriental scented hybrid around 4 feet high. Photos by Janos Agoston. 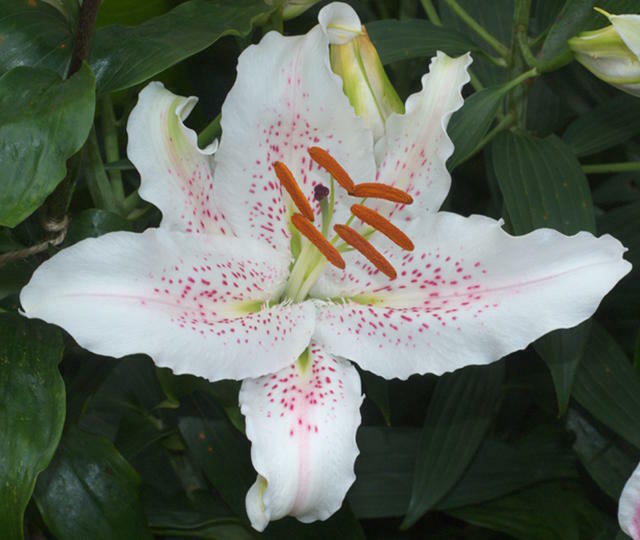 Lilium white Oriental, Gary Buckley, Tasmania, Gary Buckley.